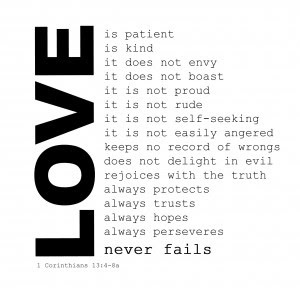 I don't know how you can get past that line that says "love never fails" (1 Cor. 13:8) without thinking that we've failed miserably at believing that. Actually, let me take that back, I do see how you could get past it. You'd need to do some brain gymnastics to convince yourself that love can sometimes mean killing, torturing, slandering, impoverishing, oppressing, and even bombing people. We often use those tactics, rather than love, in order to insure our safety or just to get what we want and to stay comfortable. But if we believed that love never fails then I don't think we'd be as inclined to justify violence and oppression. I think we might even devote ourselves to love so much that we'd even spend the same energy loving our enemies and resisting evil non-violently that soldiers spend making and preparing for war. Think of it in a specific circumstance... take the infamous "what if..." question for example. What if someone were attacking a loved one? Would you give up on "love never fails"? Would you justify your violence, distorting the very definition of love to fit your convenient violent response? Or would you actually believe that love never fails, even when it looks like it's going to, and respond in such a way that you can love your enemy and still resist them non-violently? If you believe Paul when he says "love never fails" then you must, in faith, learn to love your enemies even when it seems like the wrong "tactic." Someone once said "do what is right, come what may." If you love your enemies even when they're trying to kill you and you believe that love never fails then come what may. But if you cannot imagine, perhaps because you've lost your imagination, that love could be the answer in circumstances of war and hatred then you cannot say you believe what the Bible says. My prayer is that we all learn to believe that love never fails. Love never fails. But where there are coercive tactics, they will cease; where there are bombs built in the name of "self-defense", they will be stilled; where there is arrogance that lifts its' nose to love itself, it will pass away. Excellent! I think it may be cliche' for me to state that this is my favorite passage, but it is. Bart Campolo has suggested that since God IS love, we should read it sometimes replacing the word God for love eg. God always protects, always trusts, always perseveres. God never fails!